Giving a charity gift card is the perfect way to mark the holidays. or a business gift for clients; our charity gifts are truly for ...when meaningful matters. What better way to mark the time of year with a holiday gift that will give your recipient the opportunity to choose a cause which is closest to their heart. 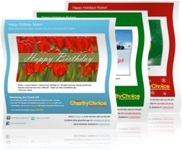 Holiday Gifts with CharityChoice is an easy and great option! Neighborhood Centers offers programs and services for youth designed to enhance their social, educational and personal development.